Workgroup colour laser printing with expanded paper capacity, combining a robust design, exceptional media handling, two-sided printing and an intuitive colour touch screen. The Lexmark Extra High Yield Print Cartridge delivers up to 20,000* pages, reducing interventions, cartridge waste and cost. * Average continuous black or composite CMY declared cartridge yield in accordance with ISO/IEC 19798. Reduce unnecessary printing and simplify work processes through solutions applications preloaded on your device. Choose additional Lexmark solutions to fit your unique workflow needs. The 4.3-inch colour touch screen allows you to operate your printer with ease and confidence through smart and intuitive navigation, easy access to workflow solutions and shortcuts, and the ability to preview your documents and print jobs at the device. Ultra-reliable paper feeding to support diverse media, including card stock, labels, UV-resistant outdoor media, banner media and more. 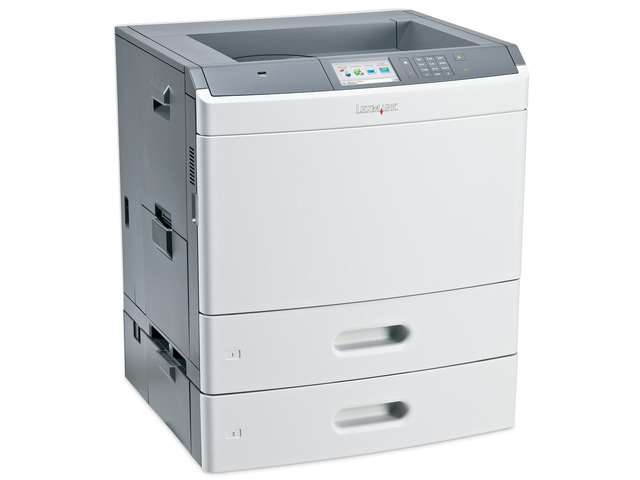 Print on multiple paper types and boost total capacity up to 3,200 sheets. Choose from four output options, including a five-bin mailbox, an offset stacker, a staple finisher, and a staple with hole punch finisher. Banner Paper, Outdoor Media, Paper Labels, Card Stock, Plain Paper, Polyester Labels, Dual Web Labels, Transparencies, Envelopes, Glossy paper, Vinyl Labels, Integrated Labels, Refer to the Card Stock & Label Guide. Trays Extended (in. - H x W x D): 25.5 x 27.3 x 20.2 in.